The sensitive nature of phones, tablets and mobile electronics make them susceptible to damage due to drop shock and over-the-road vibration. 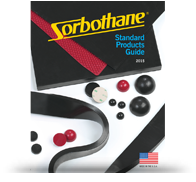 Sorbothane® corner mounts are designed to protect delicate screens and stored information from impact harm. GPS and computer systems secured in cars, trucks and tractors can be isolated from destructive vibration by Sorbothane® parts. A properly designed and executed component can help insure the integrity and function of hand-held and mobile devices. See samples of solutions we’ve provided to the Mobile Electronic Devices industry.